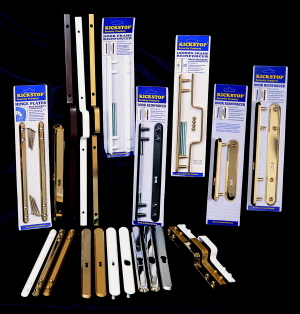 The Kickstop StapleGuard was originally known as the London Frame Reinforcer. In simple terms, it is a short version of the London Bar. The difference being that the two StapleGuard plates bolt together through the frame using four security bolts whereas the London Bar is screwed on. It is very strong indeed and resists forced entry by strengthening the door frame around the staple (keep) of a cylinder nightlatch or rim lock. The StapleGuard is available in three sizes, three polyester powder coated architectural finishes and one polished and brass plated finish. The Kickstop StapleGuard offers superior protection and resistance against kick-in attacks and forced entry. 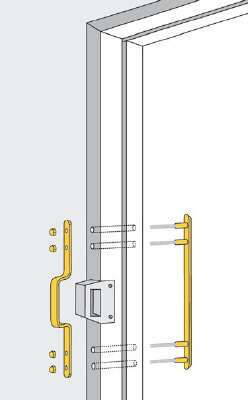 An enlarged drawing to illustrate the fitting of a StapleGuard - click here. 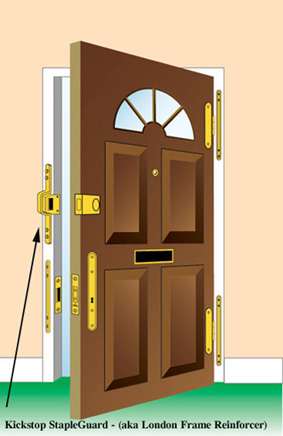 It is not 'handed' and can be fitted on the left or right side of the door frame.